Self-Esteem Building Hands-On Educational Experience created for our youth ranging from 3rd Graders up to 5th Graders. 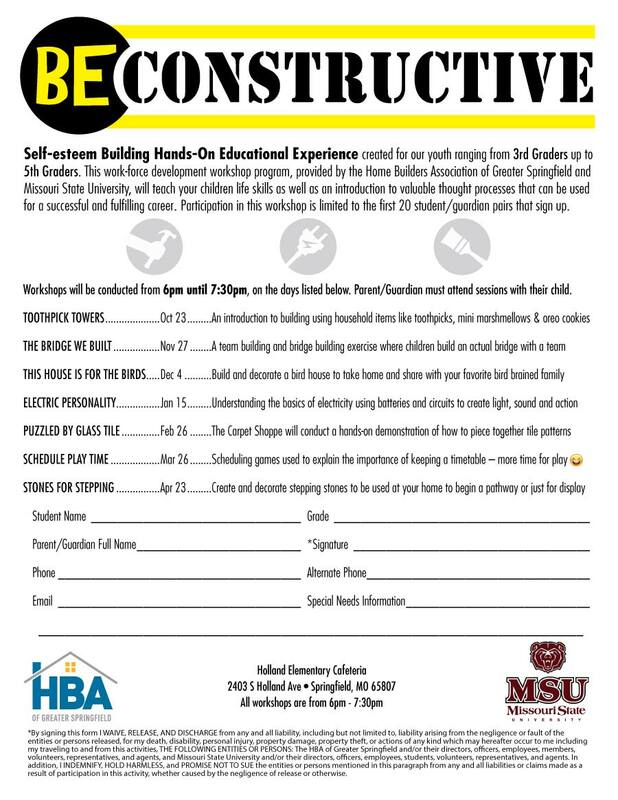 This work-force development workshop program, provided by the Home Builders Association of Greater Springfield and Missouri State University, will teach children life skills as well as an introduction to valuable thought processes that can be used for a successful and fulfilling career. Participation in this workshop is limited to the first 20 student/guardian pairs that sign up (see schedule below). The HBA is partnering with Holland Elementary during the 2018/2019 school year to promote construction career opportunities. A group of HBA members and MSU construction and interior design students will meet monthly with 3rd through 5th graders to complete small projects while exploring construction career opportunities. How can you get involved? Please call or email the HBA office to let us know you are interested! We are actively looking for volunteers to participate in this event. BUILDERS - Volunteering at one of the monthly meetings at Holland Elementary will help meet your HBA Membership Participation requirement. Please remember – we cannot solve our workforce issues individually, but together we can accomplish great things! Build My Future is a fantastic avenue to interact with high school students, but we need to start the interactions at the grade school level and this is a fantastic opportunity! Our HBA Kid Pro Zone is Under Construction for the 2019 HBA Remodeling Show. Call Charlyce or Aaron at 417.881.3711 to get involved.